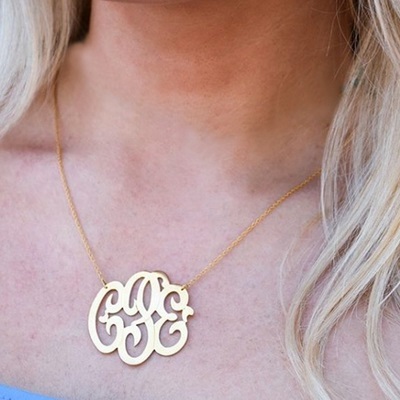 Beautiful Hand Cut Three initial Lace Monogrammed Necklace with a 16″ or 18″ rope chain. 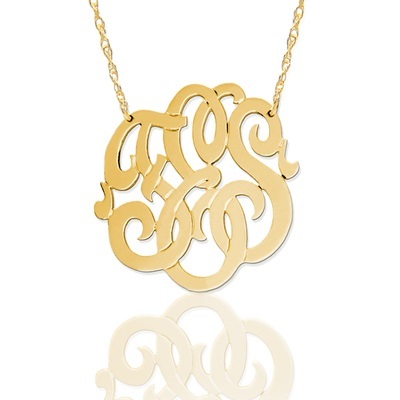 The same gorgeous necklace all the celebrities are wearing is available in 14KT Gold, Sterling Silver or Gold Vermeil (22K Gold over Sterling Silver), and your choice of 3 sizes, 3/4″ , 1 1/4″ and 1 5/8″. Please indicate your choices below. 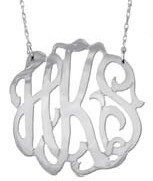 Choose an optionLarge - 1 5/8"Medium - 1 1/4"Small - 3/4"
All monogram necklaces are custom made to order especially for you. They may not be returned. Please allow 3 weeks for delivery of this item.